Glowing bubbles?! Yes! …but no. 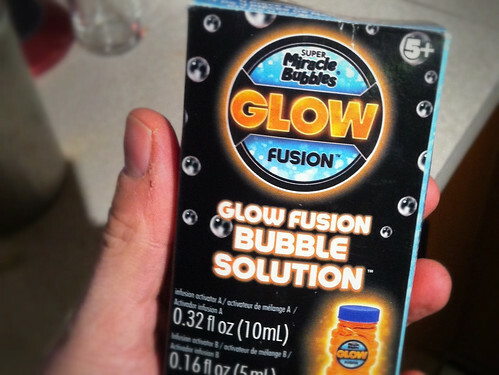 The other day I was in the store and my attention was caught by “Super Miracle Bubbles® GLOW FUSION™ Bubble Solution” — bubble soap that claimed that it made bubbles that glowed. These were not bubbles that glowed-under-black-light (fluorescent), not bubbles that glowed-in-the-dark (phosphorescent), but actually bubbles that glowed-of-their-own-accord (chemiluminescent), or so the package claimed. $3.99 later, I was the proud owner of a bottle of this magic elixir. Later that night, well after dark, Rosa and I carefully followed the instructions, adding the two included packets of “activator A” and “activator B” to the bubble soap, and stirring (not shaking!) for a minute. 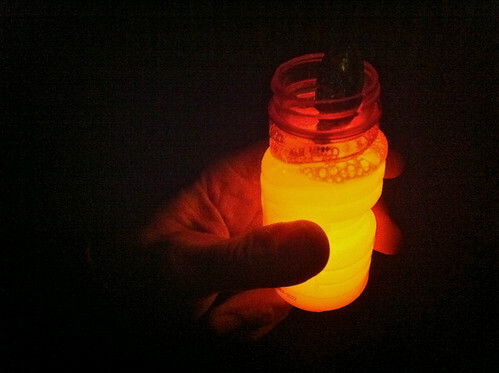 Lo and behold, the little bottle began to glow bright orange, like the innards of a glow stick! We tried and tried, and sure enough, after a while from the right angle, for a fleeting second, you could see that the bubbles had a tiny glim of light. But in practice, the drips of bubble solution that fell on the ground far outshone the bubbles themselves, and the full bottle itself was the brightest thing around. There was no hope of getting enough light out of it to photograph them. The directions (inside the package!) point all this out. They tell you to cover the (clear) bottle with black tape or a black bag, and to let your eyes fully adjust to the dark to see the glowing bubbles. Any other nearby light will drown out the few photons escaping from the bubbles themselves. Also of note: the instructions repeat several times that these are for outdoor use only. So, do they glow? Technically, yes. Practically, no. You cannot get a good, satisfying, “glowing bubble” from this bubble solution. On the other hand, it is pretty nifty to have a bottle of bubble solution that’s glowing in your hand while you’re blowing bubbles. Fun? Kinda. Worth $3.99? Not for regular use. Worth trying once? Yep, and I’m glad we did.